Do you love brownies? Are you looking for another delicious version of the chewy fudgy brownie? Well let me tell you about blondies. 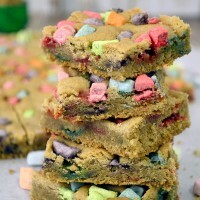 I kinda love blondies so much more than brownies. They are chewy but not too chewy, they are dense but not too dense, in my opinion next to cake they are pretty much perfect. 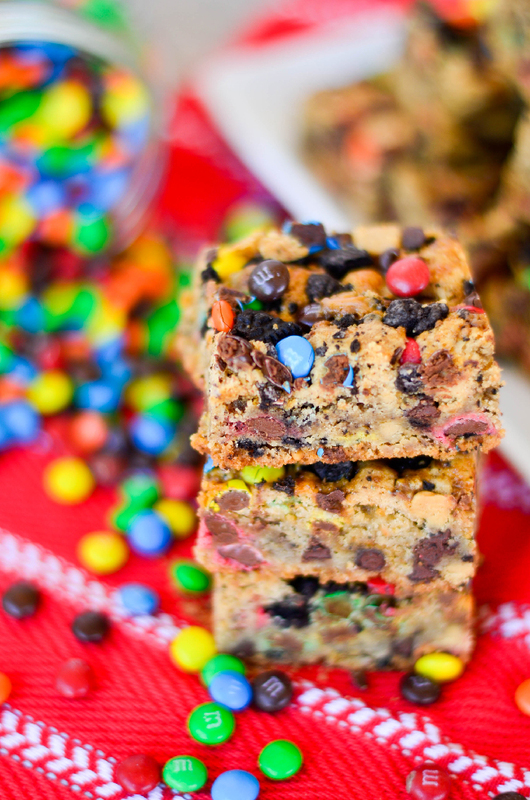 So to say these Kitchen Sink Blondies are “out of this world” would not be a lie. 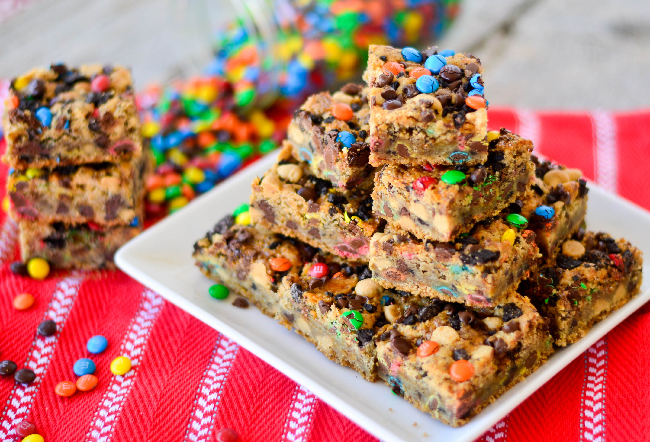 A few weeks ago I made some gourmet chocolate covered caramel pretzels and I had so much of the toppings left over it totally inspired me to make these Kitchen Sink Blondies. I used brown sugar in this recipe because I love brown sugar. It adds moisture to just about any baked good and that caramel flavor it infuses into the baked good cannot be beat. You can pick and choose which “add ins” you would like to put in your blondies. 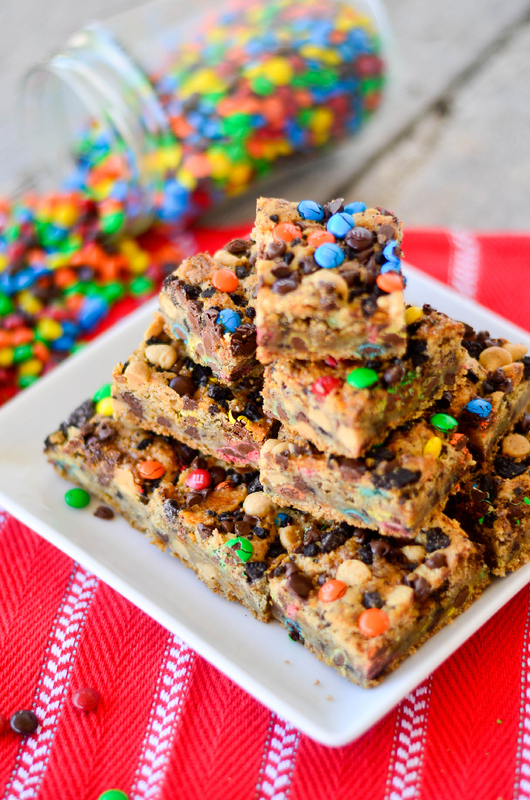 If you have half bags of various flavored chocolate chips, or leftover nuts go ahead and toss those in the batter. I think oatmeal would be another good add in. Just make sure they equal one and a half cups of add ins. Another tip is not to over bake these. As with any blondie or brownie if they are over baked they will be hard, crumbly and just not very good. I put mine in the oven for the minimum time recommended and if needed added five additional minutes to the baking time until they were perfect. Golden brown around the edges and just lightly brown in the middle. 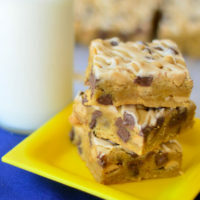 I think one other reason I love blondies is the “one time bake.” Now don’t get me wrong I love cookies to but lets be honest having to bake 6,7 or even 8 batches of cookies can be an all day thing! 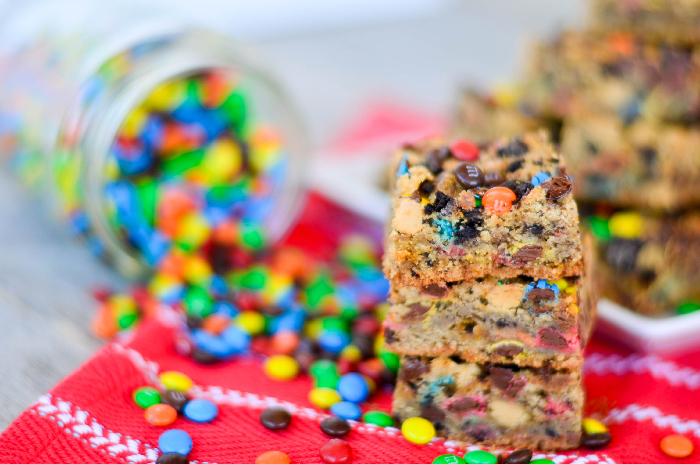 Blondies equal one pan, one bake! Gotta love that. In a large mixer, blend together both sugars and warm, melted butter. Blend until well combined, then add eggs (one at a time) and vanilla and continue to blend until fully combined. In a separate bowl whisk together flour, baking powder and salt. Then, while the mixer is on "low, slowly add the flour to the butter/sugar mixture. Stop the mixer immediately when you have added all the flour. Add mix-ins of your choice (chips, nuts, coconut) to the mixing bowl and blend just until evenly incorporated. Spoon dough into prepared pan and spread with an off-set spatula until dough is spread evenly in pan. Bake 35-40 minutes, or until the top is golden brown. Remove from oven and allow to cool FULLY before cutting (1 hour or more). 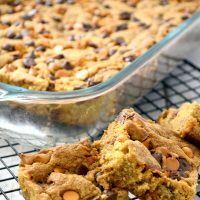 For easiest cutting, run a knife around any edges of the bars that are touching the sides of the pan, then pull up on the parchment paper and place the blondies on a cutting board. Cut with a serrated knife, wiping off between cuts as needed. 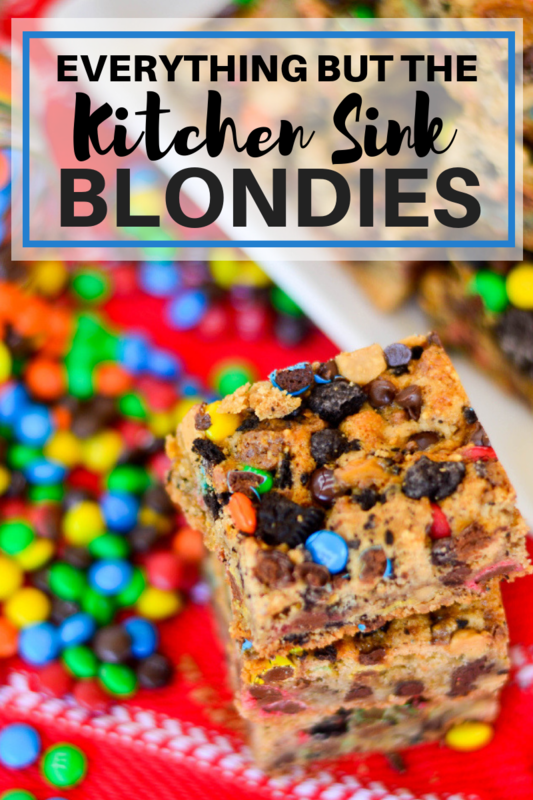 I have a few more Blondie recipes you might enjoy!